NAPO Colorado has arranged for a panel of professionals to answer our questions about their various businesses and how organizers may use them. Cost is FREE for NAPO Colorado members. $35 for guests. BONUS--guests who join NAPO Colorado at this event will have their fee applied to their annual NAPO COlorado membership fee. NAPO Colorado’s January Go Month drive produced 900 pairs of shoes! Did you know that EVERY SINGLE ONE of those pairs makes a difference in people’s lives? The used shoes we collected will go to helping entreprenuers in places like Haiti, Nicaragua, Honduras, Moldova, Sierra Leone, and Malawi create sustainable income for themselves! In fact, the sale of just 1 pair of shoes can provide 5 meals for family in Haiti. What an impact! Reserve Your Spot for Our August Presentation "Organizing For Seniors"
We have a great speaker and topic lined up for our next NAPO Colorado Chapter Meeting in August -- "Organizing For Seniors" with Kelly Grace O'Connor. This is a topic that most likely will hit most of us, either personally and/or professionally, so register now to find out more! NAPO Colorado members get in for free! Guests are welcome for only $35! 2018 Conference Recordings Now Available to Our Members! If you weren't able to get to the 2018 Conference in Chicago, don't despair. 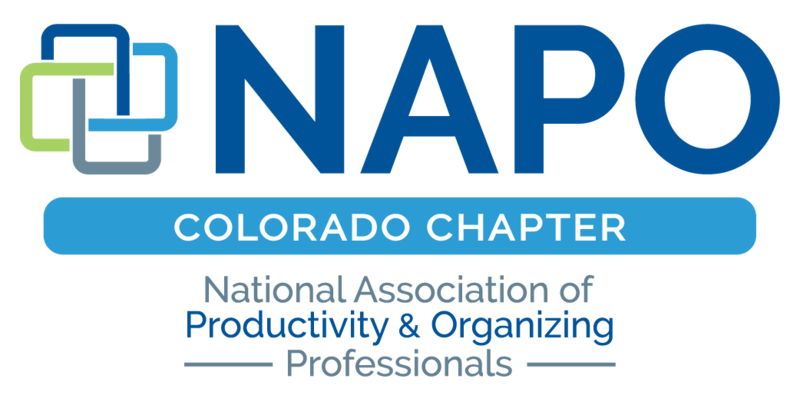 The Colorado Chapter of NAPO purchased the recordings for its members to access for free as part of their membership benefits. If you're a member, find out how to continue your education by going to the Members Only part of this website.